COATLICUE (pronounced koh-ah-TLEE-kway) is the Aztec Goddess of earth and fire, mother to all the Gods, the sun, the moon, and the stars. 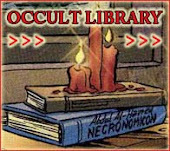 Her name means "the one with the skirt of serpents", and she is usually represented wearing her skirt made of snakes and a necklace of human skulls, hearts, and hands. 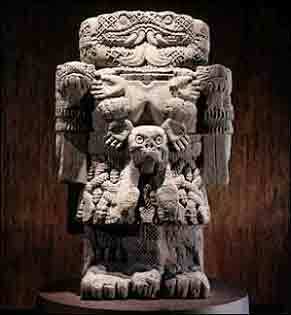 Coatlicue is often referred to as a devouring mother, but this representation is not as negative as it sounds. She is the mother who gives us life and then accepts our bodies at death, "devouring" them in order to purify the soul. Coatlicue's unexpected pregnancy from a magical ball of feathers led to the uprising of her other children, led by her daughter Coyolxauhqui. Her son, Huitzilopochtli, sprang from her womb fully grown and armored, and killed his brothers and sister. Coatlicue was struck by grief, both for her children's treachery and the death of her beautiful daughter. She had Huitzilopochtli put Coyolxauhqui's head into the sky as the moon, so that she could see her daughter's face, even in death. Coatlicue is also known as TOCI ("grandmother"), TETEOINAN ("Mother of the Gods"), and by the epithets MOTHER GODDESS OF THE EARTH WHO GIVES BIRTH TO ALL CELESTIAL THINGS, GODDESS OF FIRE AND FERTILITY, GODDESS OF LIFE, DEATH AND REBIRTH, and MOTHER OF THE SOUTHERN STARS.